OMFG this is an awesome wallpaper!! this is such a magnificant wallpaper, i love it! Whoa..another wallpaper...submitted? Whoa..>.< Too many being submit lol. Looks fine..i dont really like the background. Your backgrounds do need a lot of work, and a lot more layers. wow...this looks great!! the colours is sooo calm...i really like it! the bg is sooo pretty!! great job!! The water doesn't look as if it goes into the distance, mostly because it's a single color. If you want the water to go into the distance better, you should make use of the dodge or the burn tool, depending on where the sun is. If the sun is in front of the scan (meaning that it is not visible i any way on the wallpaper, assuming that the sun is somewhere in front of the scan), then the burn tool should be used on the sky and the water. If the sun is behind the scan, then the dodge tool should be used on the sky and the water. The planet has some pixelation on it. The scan is also too blurry. You used an outer glow on the scan which doesn't help when trying to search for extraction problems, and it's not recommended for this type of wallpaper. Keep practicing. Very pretty wallpaper. I think it looks nice so good job with it. wow!! !, I love this, blue shades everywhere!! 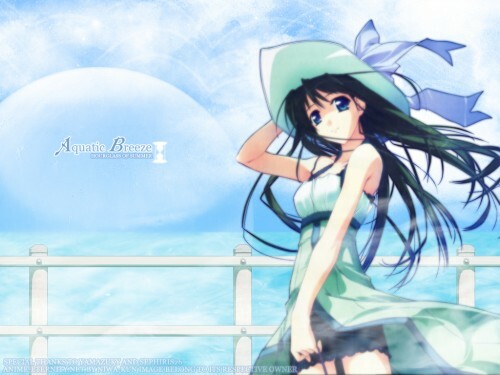 !, I love blue!, the girl is very cute also, Its a favorite! me love it :D i've always been a fan of the hourglass of summer wallpapers! Well, I like this wall a lot. The scan is wonderful, and I love how you put a bit of mist before it. But the ocean looks a bit weird though. This is a awesome wallpaper, and it features Kaho from Hourglass of Summer a very cute girl from a great game, I love how you have her so it does look and feel like the wind is blowing around her, and the fence is a nice touch it does look like fencing near bearches excellent job. Wow, another great wallpaper from you. I like this one a lot! The scan looks a little blurry, but it's not so bad, it makes the it look dreamy. The sky looks a but weird with the lines. It looks more abstract than scenic, not that it's bad. I love to see more works from you. Keep up the great work! adding outerglow does help in extraction problems x_x i always do that lmao. well anyways enough bout that..
wow ... great ... the effects are great and the mist is awesome! wow! it's such an awesome wallpaper! wheni see this, i just want to kick back and relax!